Gulf Oyster Reefs Are Hurting. Now There's Help From Oil Spill Aid Money Oyster harvests in the Gulf of Mexico have declined dramatically. Now scientists are working to rebuild oyster reefs, helped by settlement money from the Deepwater Horizon oil spill. Oyster harvests in the Gulf of Mexico have been in decline for decades. Off Cedar Key on Florida's west coast, the water is some of the most pristine in the Gulf. The estuary there has long supported a thriving seafood industry. 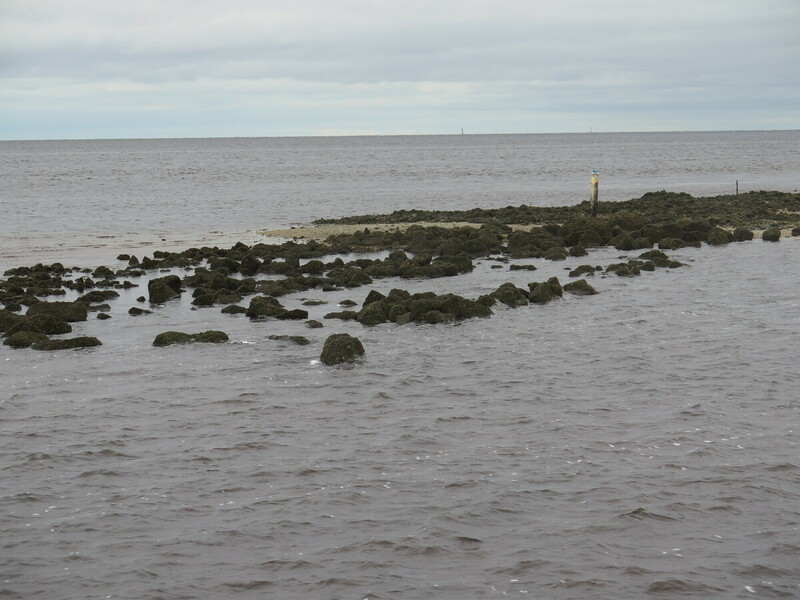 Sue Colson, a city commissioner in Cedar Key, says one of the best places to harvest oysters used to be the Lone Cabbage oyster reef, about a mile offshore. When the tide was really low, she says there were so many oysters that she and her husband could walk along the reef picking them up. "We would pull our children out of school on a really, really, really, really blow out tide," she says. "And everybody would pick up and get as many as you could in that time when they're exposed." Those days are long gone on Lone Cabbage Reef. Over the last thirty years, Peter Frederick, a wildlife ecologist from the University of Florida, says oysters, the mollusks that build and make up the reef, have died off. "Once they die and you lose those," Frederick says, "the reef starts degrading and losing elevation. We've been seeing about three to four inches loss a year." When the reef is gone, it leaves behind sand bars that young oysters can't attach to. All along the Gulf coast, it's not a good time for oysters. 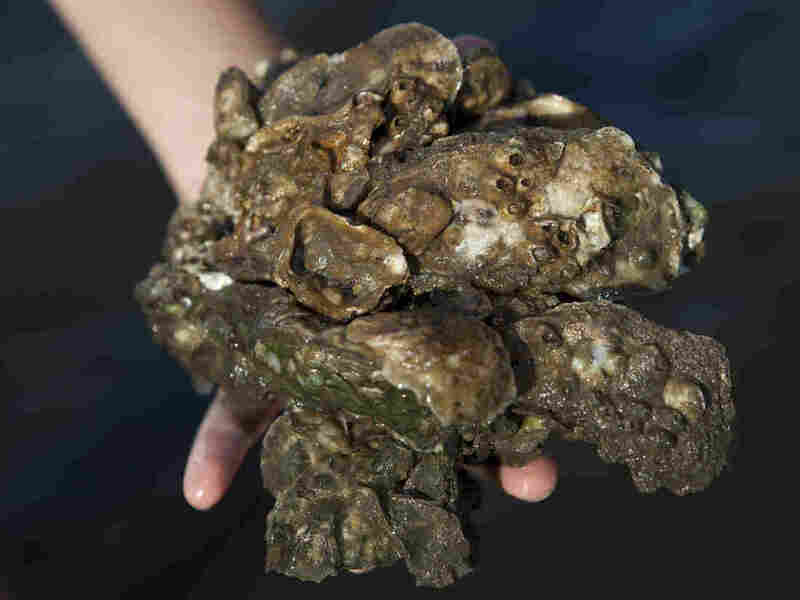 Scientists say eighty percent of the Gulf's oyster reefs have been lost in recent decades. And harvests are way down. Over time, Texas has seen production cut by half. A few years ago, Florida's Apalachicola Bay, long the heart of the state's oyster industry, was declared a fishery disaster. This year Alabama canceled its season entirely because there were so few oysters. There are many reasons: overharvesting, drought, even hurricanes. But ecologist Frederick says a major factor is a lack of freshwater. Agriculture and development is claiming much of the water that used to flow down rivers, leaving estuaries like this one too salty. "The eastern oyster," he says, "doesn't like full strength seawater. And at high salinities it tends to become susceptible to its diseases and parasites, and so they tend to decline fairly rapidly." As oysters have died off their reefs have degraded, losing several inches a year. Scientists are building them back up using rock from a quarry. Here, and throughout the Gulf, a lot of work is going on to help oysters and the communities that depend on them. Frederick has been overseeing efforts to restore Lone Cabbage reef. It's a nearly $7 million dollar project that has rebuilt the three-and-a-half mile long reef. Standing on a barge alongside it, Frederick says instead of oyster shells, this reef was rebuilt using rock. "We've had to have heavy equipment," he says, "like barges and cranes, trucks and breaking equipment" to transport the rock from a quarry. It's a project paid for with money from the BP oil spill settlement. Billions of oysters were killed in the spill, and that was just a small part of the extensive damage done to the environment. $160 million of the fund is earmarked for oysters. Bob Bendick oversees several projects to restore oysters in the Gulf for the Nature Conservancy. He calls the oil spill fund "a unique, maybe once-in-a-generation, or forever opportunity to reverse the decline of oysters in the Gulf." The Nature Conservancy recently helped rebuild an oyster reef in Texas' Matagorda Bay. It's beginning a similar project soon in Florida's Pensacola Bay. Bendick says one idea being discussed is a project that would build a chain of new oyster reefs across the Gulf. "They could be kind of oyster sanctuaries that would produce more oysters," he says. On Florida's Big Bend coast, there's a lot of support for efforts to rebuild oyster reefs. Fishing and harvesting oysters, crabs and clams is not just an industry but a way of life here, one that's long been under pressure. Jack Payne, who directs natural resource research at the University of Florida, sees another benefit in restoring the reefs; it may help prepare coastal communities for climate change. "Oyster reefs are wonderful natural barriers to storms, and hurricanes," he says. As sea levels rise, "this is something that we hope we can apply throughout the Florida coastal system." On the newly built up rocks at Lone Cabbage there are already encouraging signs. Researchers say young oysters are beginning to show up on the reef.